It's been a little over two years since my first ebook, Presenting for Geeks, was released. I made the deliberate decision to write it in English, despite this not being my native language, in the hopes to reach a wider audience that way. I think it mostly worked out okay, thanks in no small part to my editor Anna Kent, who dutifully corrected my English and overall made it a better book with her sometimes radical but always necessary cuts. I do get asked for a German translation from time to time, though. Until very recently, I simply didn't have the time to do it (hiring a translator was pretty much out of the question for cost reasons). Back in January, I sat down one day to see how hard it would be - and finished the translation just a few weeks later. Friends and family volunteered to proofread it and now I'm happy to announce that Präsentieren für Geeks, the German edition of Presenting for Geeks, is available for purchase from the Amazon Kindle Store. The translation also gave me an opportunity to check how the book has held up. I think it's doing well, if I may say so myself. Sure, I had to resist the temptation to add more material in some places that I now feel could do with more extensive coverage, e.g. storytelling. But for the intended purpose, which is "If you read nothing else about presenting, please at least read this", I still think it's perfectly adequate. "If you or someone on your team wants/needs good presentation advice from a fellow technical presenter, then this is the book." Below is a description of the book's contents in German. If you know anyone who would be interested in this topic but would rather read about it in German, please pass this on. Thank you! In "Präsentieren für Geeks" steht das Publikum im Mittelpunkt. Ausgehend von diesem Perspektivwechsel wird erläutert, wie man Präsentationen so aufbaut und (nicht nur) technische Themen visualisiert, dass sie das Zielpublikum besser erreichen und die wirklich wichtigen Punkte auch im Gedächtnis bleiben. The ebook is available from the Amazon Kindle Store (Kindle format only) and Google Play. 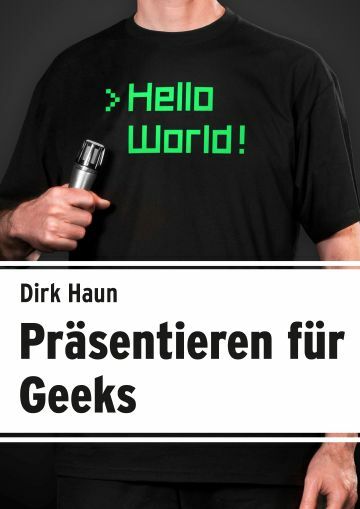 "Präsentieren für Geeks - The German edition of Presenting for Geeks is out now" by Dirk Haun is licensed under a Creative Commons Attribution-ShareAlike 4.0 International Licence.